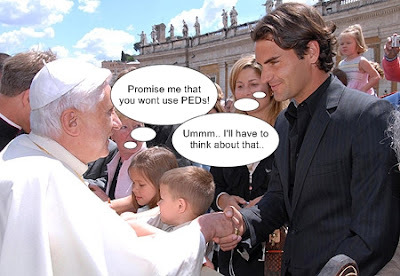 The Pope Warns Athletes on Doping; Does Federer Care? In a sickening display of perverse wealth and power, Roger Federer plays at his new London based home. A home built with one purpose in mind: to allow Roger to fantasize and possibly go one step even further, to ensure he finally defeats Rafael Nadal. Roger enlists the help of his wife Mirka, to play out his blackmail scheme, gloating all the while that he is also doping to the limits of his 29 year old body. Episode 3 of "Doping for Glory: The Roger Federer Story" takes the viewer inside Fed's private life for a glimpse at the perverse acts he is going through right now to quench his insatiable desire for power and glory. Roger, when the Pope is asking you to stop doping, you better listen. You better stop thinking beating Nadal at all costs and clean up your body!! 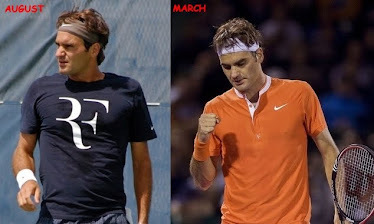 I have been a passionate and loyal Roger fan for the last 5 years. I would often sacrifice my sleep to see him play. However, after seeing the evidence on this site, I am no longer his fan. It is clear that he is the same as the rest of them, a doper. I hope he is banned and stripped of all his titles. i feel so depressed right now. To the person who has posted all this evidence, thanks for opening my blind eyes. This is fantastic! Fedtards are crying a river of tears. Roger Federer is a doper and he still can't beat a clean and humble Nadal. Nadal Haters are such uptight losers. Is Mirka just an enabler in Fed's doping? Is she actively involved in getting him designer roids and EPO? Is it possible she silently disapproves?